What's so unique about C2? Beyond curating inspiring speakers and attracting the right participants, what can a conference do to meaningfully and creatively connect people? What do you think of when you hear the word "conference"? Branded bags filled with flyers and free mints? Awkward conversations over coffee and muffins — about the coffee and muffins — before you head into the opening keynote? Trying to speed network over a plate of buffet food? Or… do you associate the word conference with things like meaningful play, sense shifting, brain-dating, interactive art installations, business matchmaking, and empathy workshops? Even though most people wouldn’t associate these things with the conferences they’ve attended, they probably would like to. This was the idea behind creating C2 Montréal: reinvent the conference experience. Conceived in a 24-hour brainstorming session in old Montreal by 25 people, including people from Sid Lee and friends, C2 was born to maximize creative inspiration for the attendees. But beyond curating inspiring speakers and attracting the right participants, what can a conference do to facilitate this? In the case of C2, it has as much to do with the physical conference space and interactive content as it has to do the speaker selection. "Our goal is to shift the attendees from being spectators to being actors," explained Antoine Roy-Larouche, director of Collaborative Experiences, explained. "C2 is about living something that will transform you." So what does this mean to you as a conference attendee? How does one ‘live’ a conference? The short answer? Create an experience, not a conference. The long answer? It’s much more nuanced and well thought-out and includes everything from the physical space to matchmaking. Go back to your experience with most conferences. This may sound familiar: you arrive, get your badge and tote bag, then wander around an exhibit hall, find some coffee and make your way to the opening keynote. You may talk to the person sitting next to you, but most likely it’s just to share the plug you’ve both gathered around because you intend to answer emails between the key learnings. At breaks and lunch, you scan badges and other signs that you should talk with another attendee. By the end of the day, really good networkers have gathered a few cards to follow up on, but most of us go home with a bunch of scattered notes we’ll never end up getting back to. The team at C2 has re-engineered this entire experience, including how to connect you with relevant attendees. When you ask most people why they attend conferences — especially with so many talks available online — they’ll often reply with the same answer: the networking. The best conferences in the world attract the best attendees and C2 prides ourselves on the types of people who attend each year. C2 attracts 5,000 people from over 43 countries and over 24 industries. The majority of the attendees are key decision makers in their organisations. However, even the most accomplished CEO still needs some guidance when it comes to connecting them to the right people in a crowd of 5,000 people. This is where Brain Dates come into play. C2 works with local Montreal-based EdTech platform E-180 to transform the C2 village into a bustling peer-learning hub. In 2015, thousands of participants used the application to connect and learn from one another through one-on-one learning meetings — or "Brain Dates," as E-180 calls them. Aside from the app, there is also a Brain Dating Lounge where trained matchmakers help you find your match. The idea is that you get to plan one-on-one meetings in advance, so that you get the most out of your time at the event, find out who are the people you should meet, and maximize your learning and networking opportunities. But if you still don’t know where to start, you can always lean on your trusted Concierge Extraordinaire. As a C2 participant, you will arrive and be greeted by a Concierge Extraordinaire, whose sole job it is to provide participants with a preferred point of contact, to assist them in the discovery and navigation of the conference, as well as the surrounding city of Montréal. And you won’t receive a tote bag filled with sponsor ads and be sent away, instead, you will be guided on a hero’s journey, one that begins with a tour of the C2 village, which includes the forum, the hangar, and the plaza. The forum is the space for inspiration. When you enter the forum, you will be greeted by music by a DJ in residence, who is setting the mood for the day and telling a story through the music. Show Director Thomas Pintal says the point of the music is to "get people to relax and get more introspective," a theme that is carried through the entire C2 experience. The forum is also where you will watch the incredible speakers who have been carefully selected to not only fit, but also challenge the theme. The C2 programming team conjures a speaker roster designed to inspire participants. Inspiration comes in many shapes and sizes, and the curated lineup of speakers strives to include both next-generation up-and-comers and established innovation icons. The curators search far and wide for just the right stories to build the narrative. Between the speakers are artistic performances that bring another dimension to that narrative. "When the doors close and conference begins, you can expect to live an experience," Pintal says. Though there are a handful of conferences that put this much effort into their speaker lineup, there fewer that combine this with the facilitation of experimentation. This is where the hangar comes in. Encourage the cross-pollination of ideas. "The hangar is where you learn that the purpose of the body isn’t to merely move your head from meeting to meeting," Roy-Larouche described. 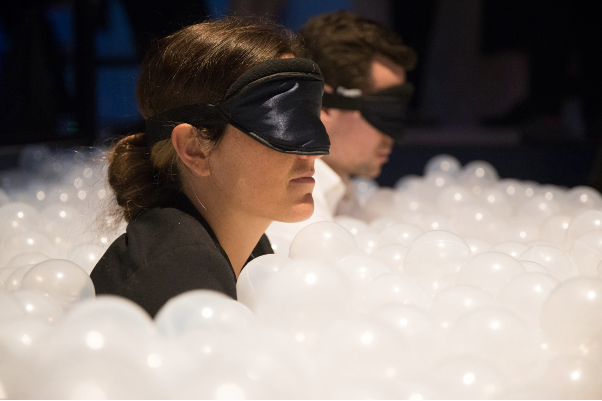 What Roy-Larouche is referring to are experiences like the ball pit from 2014, where participants submerged themselves to their shoulders in clear plastic balls while wearing a blindfold before they brainstormed on questions posed by someone they can’t see. The blindfold removed any bias on the part of participants as they interacted, which was significant as one of the people joining the brainstorm was Muhammad Yunus, Nobel Peace Prize recipient. The blindfold allowed the participants to speak freely in a situation that may have made them nervous. In 2015, participants climbed up a ladder to enter The Nest, a small, intimate space built out of tree branches, created by Cirque du Soleil’s C:Lab. Once inside, strangers were guided by a moderator in a discussion. Once finished, participants exited via a slide. Another unique experience was created by suspending chairs and a net 18 feet in the air, challenging participants to express their ideas while feeling physically vulnerable. All of these challenges provide the framework around which participants can develop ideas together, without fearing the consequences. C2 provides the environment where one can be fearless, and where everyone is game. The hangar is a place to test hypothesis and processes: risk is encouraged and failure is celebrated, giving participants the confidence to later apply results of the out-of-the-box experiments conducted during the event. Workshops are another great context for C2 participants to meet and network with each other. C2 brings together a dizzying array of creative talents, young entrepreneurs and senior industry executives, all from various industries, disciplines and countries. Workshop participants benefit from sparking exchanges and making personal connections with such a dynamic collective. Many C2 speakers choose to take the opportunity to dig deeper into their subject matter by leading masterclasses, where they work with small interdisciplinary groups of participants to try out new methodologies, and turn ideas into solutions. But all of this physicality and stimulation can leave a person hungry and in need of rest, so to round out the C2 village there is the plaza. The plaza is for celebration and connection. Here, you will find popup shops, multiple food choices through Montréal’s best local restaurants and food trucks, and rest areas to unwind and connect with other participants or just sit back and reflect on everything you’ve just experienced. In 2015, participants climbed aboard a colourful ferris wheel with a stranger to share the Montréal vista and played skeeball and other carnival games with new friends. Everything in the plaza is designed for connection. Communal meal seating and unassigned seats during talks means that participants are not always sitting next to the same person. The site and programming are also designed so that people have to move between spaces: this provides additional opportunities to bump into attendees they would not otherwise have crossed paths with. At night, the plaza comes alive with music and celebration. Participants are invited to connect on a different level through a whole schedule of spectacle-filled evenings showcasing leading international and promising local artists and performers. C2’s evening celebrations have involved artistic partners including the world-renowned talents of Cirque du Soleil, Moment Factory, Montreal’s International Jazz Festival and Moby. Woven throughout the entire village are exhibitions that merge technology and art and invite the attendees to interact. "We integrate the artists mis-en-scène, not off to the side," said Génifère Legrand, VP, Creation. This integration is just one of the details of the overall way that C2 transforms the participants. Many newcomers arrive, merely excited to sit back and absorb the messages from the excellent speakers, only to find themselves becoming part of the message. With all of this activity going on, many attendees have reported to be so absorbed in the experience that they forgot to take notes. C2 has you covered here as well with The Minutes, a comprehensive book of insights, learning, and highlights from the entire 3-days, including talks, workshops, and conversations. This book, available to attendees via electronic or print versions, is an incredibly thorough summary of everything you need to take away from your C2 experience. The 2015 edition was over 130 pages and is as beautiful as it is valuable. Harvard Business Review called C2 a "conference like no other," focusing in on the way that the experiences encouraged participant interaction. A study by Price Waterhouse Cooper in 2014 showed that one in four companies made a deal at the event. Many attendees send notes to the team post event each year to thank them for changing the way they do business. The C2 experience is a winning one, but the team is always looking to improve. "We start with a clean slate every year," Legrand revealed, "We take the comments from participants each year and learn from them, and every year we improve the experience." We can’t wait until the 2016 C2 village is unveiled and you are playing in it.